Introduce your baby to farm animals with this touch and feel baby board book. Tickle and stroke each tactile texture together with your baby and watch them discover their favourite farm friends, from a velvety cow, a woolly sheep, to a fluffy chick, and more.Covering early learning concepts such as colours, shapes and patterns, Baby Touch and Feel Farm Animals is perfect for encouraging tiny fingers to explore and young minds to develop, while its sturdy pages with rounded corners make it a book that will last for years of reading fun. Babies will love this touchy-feely book, packed with appealing photographs of cute animals and tactile textures to engage the senses. 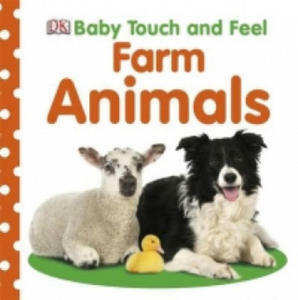 This title helps you introduce your baby to farm animals with touch and feel textures. You can tickle and touch the textures together with your baby and watch them discover their favourite Farm Animals. You can encourage your baby to learn early concepts such as colours, shapes and patterns as they turn each page. You can let their little hands roam to find a velvety cow, a woolly sheep, a feathery cockerel, and a cuddly kid. Twinkly, fluffy and fuzzy textures in a chunky package are perfect for encouraging tiny fingers to explore and tiny minds develop. Sturdy pages with tactile covers and rounded corners mean these books will last years of reading. Touch and Feel Farm (Scholastic Early Learners) Scholastic Inc. Babies will love exploring the world of farm animals through this fun 'touch and feel' board book, perfect for very young children. The small, padded book is ideal for little hands to hold and filled with tactile areas to explore. 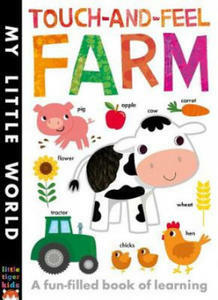 Packed with adorable full-colour photos of farm animals, this book will entertain babies time and time again. Introduce your baby to the fun of the farm with this touch and feel baby board book. Tickle and stroke each tactile texture together with your baby and watch them discover the scratchy feel of straw, the woolly tummy of a lamb, the shiny bonnet of a tractor, and more.Covering early learning concepts such as colours, shapes and patterns, Baby Touch and Feel Farm is perfect for encouraging tiny fingers to explore and young minds to develop, while its sturdy pages with rounded corners make it a book that will last for years of reading fun. Teach your child all about farms with touch and feel textures in this chunky board book. Twinkly, bumpy, scaly, silky, sandy, sticky and shiny textures in a chunky package will help your child discover all about farms. Oink oink! Quack quack! Let their little hands roam and feel how velvety the pigs nose is and how fluffy the chicks feel. Read it together - they'll learn as you play. These Touch and Feel chunky padded board books will help encourage your child's early learning and language. It is perfect for encouraging tiny fingers to explore and great for sensory development. Teach your baby all about farms with touch and feel textures. Stroke, tickle and touch the textures together with your baby and help them discover all about farms. Oink oink! Quack quack! Let their little hands roam and feel how feathery the ducklings are and how soft the piglets feel. They'll learn as you play. Twinkly, bumpy, scaly, silky, sandy, sticky and shiny textures in a chunky package is perfect for encouraging tiny fingers to explore and tiny minds to develop. An adorable and irresistible touch-and-feel board book for babies and toddlers, full of fabulous photos of farm animals to stroke and textures to explore. Feel the ducklingâs downy feathers, the fluffy chick, the sheepâs wool, the cow's hide, and the pony's mane. On each double-page spread, there is a different texture to find, and the rhyming text makes the whole shared experience an enjoyable one for both parent and child.